Payroll Relief is a payroll processing system that accelerates payroll management and transforms it into a hassle-free procedure. With it, a single member of your organization can handle up to 200 payrolls at a time. The solution makes this possible through its robust automation capabilities that can put into autopilot a wide array of tasks. The list includes direct deposits, tax payments, tax filing, and electronic child support. On top of that, the software allows the batch processing of payroll approval and check printing. This gives you unprecedented efficiency in your payroll workflow, thereby allowing your company to be more profitable. Payroll Relief was designed with the payroll procedure sequence in mind. Because of this, your accountants only have to focus on relevant tasks rather than on arranging elements of the interface. This allows them to work faster, thereby reducing the occurrences of overtime work and additional expenses. If you are a firm offering payroll services to clients, then you can effectively meet the unique needs of each one with Payroll Relief. That is because the solution has robust customization options that allow you to tailor every facet of the interface. This allows you to streamline your workflows even when you are switching between windows. As such, you can work with minimal disruptions to complete your payroll processes more rapidly. Payroll Relief has a broad array of automated tasks. On top of that, it can process payrolls and checks by batch, allowing your employees to save time. Plus, the system releases documents like W-2s and 1099s to employees’ portals all at once automatically. With this, you can save your HR department the hassle of distributing them manually. Payroll and accounting are intricately tied together. That is why Payroll Relief supports integrations with popular accounting systems such as QuickBooks and Sage. And in case your preferred accounting software is not supported, you can still synchronize your data with them. The platform makes that possible by generating a generic file that you can import to your favorite accounting program. It is crucial to note that virtually no software in the Payroll Software category is going to be an ideal solution that can meet all the needs of different business types, sizes and industries. It may be a good idea to read a few Payroll Relief reviews first as certain services can perform well only in a really narrow set of applications or be designed with a very specific industry in mind. Others might operate with an idea of being easy and intuitive and therefore lack advanced functionalities desired by more experienced users. There are also software that focus on a large group of users and provide a powerful feature set, however that usually comes at a more expensive price of such a software. Ensure you're aware of your requirements so that you choose a service that provides exactly the features you look for. How Much Does Payroll Relief Cost? 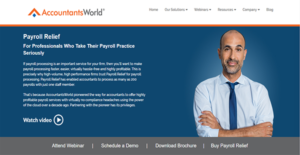 We realize that when you make a decision to buy Payroll Software it’s important not only to see how experts evaluate it in their reviews, but also to find out if the real people and companies that buy it are actually satisfied with the product. That’s why we’ve created our behavior-based Customer Satisfaction Algorithm™ that gathers customer reviews, comments and Payroll Relief reviews across a wide range of social media sites. The data is then presented in an easy to digest form showing how many people had positive and negative experience with Payroll Relief. With that information at hand you should be equipped to make an informed buying decision that you won’t regret. What are Payroll Relief pricing details? What integrations are available for Payroll Relief? If you need more information about Payroll Relief or you simply have a question let us know what you need and we’ll forward your request directly to the vendor.